On the surface, American Hustle has the makings of a great movie: an all-star cast, early Oscar buzz and the promise of a fun romp through the 1970s world of glitz, glamour and the underground world of political scandals. What we get though, is a dark dramady loosely based on a FBI sting operation-turned-scandal from the late 70s/early 80s called Abscam. The story centers around con-artist Irving Rosenfeld (Christian Bale) and his British partner Sydney Prosser (Amy Adams) as they take a local scam operation to new heights. Along the way, the pair catches the attention of FBI Agent Richie DiMaso (Bradley Cooper), who promises to let them walk away from their prior crimes if they help him with an undercover sting operation. The targets: Camden, N.J. mayor Carmine Polito (Jeremy Renner) and a group of senators and congressmen, thrown in for good measure. Things are going along smoothly until mobsters get involved, Rosenfeld’s wife falls in love with one of them and the plan starts to unravel. Sounds great right? Unfortunately, though, the story is just so-so and without the help of terrific actors like Amy Adams, Bradley Cooper and Jennifer Lawrence, the movie probably wouldn’t be getting the kind of attention the critics are giving it. 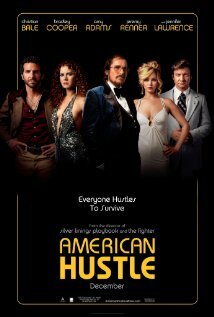 The biggest problem with American Hustle is a lack of action and the movie’s very dialog driven story line, which at times, causes the film to meander. It’s not suspenseful, edge-of-your-seat storytelling either, so many people will probably find themselves bored and wondering when the movie is going to end. Some humorous interjections into the dialog help revive the sluggish moments, but they are few and far between and it’s not nearly enough to save it. The real draw and main reason to watch the movie is the performances. Jennifer Lawrence and Bradley Cooper are outstanding in the film – especially Lawrence, who plays Irving Rosenfeld’s zany wife – but their characters are so similar to ones they played in Silver Linings Playbook (also directed by David O. Russell), which overshadows their performances in this movie just a bit. If anyone is deserving of an Oscar though, it’s Amy Adams. She fully embodies her character, mixing saucy with sweet and you’re never really sure who’s side she’s on until the very end. American Hustle is a prime example of a director’s vanity piece. It’s over-indulgent, thinks it’s better than it is and critics will love it. It may even win several awards. But a typical movie goer probably won’t get into it. If you do go see it, don’t let American Hustle con you into thinking it’s one of the best movies of the year – because it’s definitely not.